There are still spaces available on the Level 2 coaching course in Keighley this year - starting on May 18th. The closing date for applications is the 29th of March. Recent research has identified that one of the reasons people give up the sport after only a couple of years is the lack of development with their shooting. Level 2 coaches are equipped to help club archers progress and develop, thus hopefully keeping more people in the sport. Course code: 19 L2 08. The Northern Counties Coaching Conference 2019 will be hosted by the Yorkshire Archery Association, and will be held at The Scout Hut, Ethel Ward Playing Fields, York Road, Haxby, York YO32 3DY on Saturday the 27th of April. The theme is Mind and Body. The cost is £25, which includes refreshments and lunch. Archery GB has published its coaching plan for 2017 to 2021 and issued an update in November. Coaches are advised to familiarise themselves with this important document, which will drive archery coaching at all levels for the next few years. Arrowhawks Archery Academy Junior coaching and training session at Haxby, York on Saturday 2nd March. These sessions follow the National Talent Development Programme and Academy models; lead coach Kath worked on both programmes for 7 years and is supported by a range of coaches with talent development training and experience. Sessions include technique analysis and coaching, programme planning and development, equipment set up and strength and conditioning appropriate to age. Open to recurve and compound archers, target and field. On 2nd December, First Point Archery is organising a compound day in Keighley, led by compound specialist Martin Holtby. For compound archers, coaches and the curious are invited to attend. Schedule: Sunday 2nd December 10:00 AM - 4:00 PM. Coaches gain CPD points for attending. Location: Keighley Table Tennis and Recreation Centre, Keighley, BD21 1SY, West Yorkshire. Arrowhawks Archery Academy will be running coaching and training sessions throughout the winter at Haxby York and in the spring at York Bird of Prey Centre. Sessions are available for both juniors and seniors. A compound day with Martin Holtby. Coming To Blackridge Archery on Saturday 22nd September 2018. We are running a Level 1 Coaching course - details as follows. for further details or to make a booking. There are still a couple of places left on the Level 1 Coach training course which will be held in Keighley, starting on Saturday the 1st of September 2018. The course will be held at Keighley Table Tennis and Recreation Centre, Floor 2, Keighley Business Centre, South Street, Keighley, BD21 1SY. All sessions will be held indoors. Arrowhawks is a registered Archery GB club as well as an academy style training programme delivered at a local level open to any Archery GB members. It incorporates the previous YAA squads but is also open to archers from other counties. A coaching/training programme tailored by level for novice, intermediate and advanced archers up to age 20.
and training planning and programmes. Recurve and compound welcome. Target and field archery catered for. A programme of six tailored and processional sessions over the winter months to help archers of all levels keen to improve. Training and competition effective planning and building your own training programme. Bookings can be made by session with discounts for those booking the full programme. Trinity Archery Coaching are fast approaching our next winter coaching sessions, starting in October 2018. This is our sixth year using Leeds Trinity University sports hall, an excellent venue allowing for a team of coaches to supervise shooting, coaching and video analysis, all taking place at the same time. This coaching is available to all archers shooting all bow types. We are running a Level 2 Coaching course - details as follows. Coaching Week is coming! Join us as we celebrate Great Coaching, 4-10 June. The inaugural event will see a week-long celebration of #GreatCoaching take place across the nation, with UK Coaching working alongside a range of partners and national governing bodies of sport to recognise great coaching. Over nine million adults in the UK have received coaching over the past 12 months with a broad range of benefits delivered to recipients. To mark Coaching Week, UK Coaching is inviting people across the UK to share when and where they have experienced great coaching. To help people know what they are looking for, UK Coaching is currently working with agencies to develop our Principles of Great Coaching, aimed to help define great coaching. These principles will help people recognise and understand great coaching. Each day we will be highlighting great coaching stories as we bring to life what great coaching is and how it continues to benefit others - and we want you to join us. If you're a coach yourself or know somebody else who is, then join us on social media by celebrating what makes them a great coach using the hashtag #GreatCoaching. We'll also be providing you with an opportunity to recognise your own coach who demonstrates our principles of great coaching. Put Coaching Week in your diary and keep up to date with all the latest information. Join us in celebrating coaching and supporting Coaching Week from 4-10 June 2018. We'll be releasing great coaching content to celebrate Coaching Week each day from 4-10 June. Here's how you can play your part in celebrating Great Coaching. Celebrate Great Coaching by telling us your stories of how coaching has helped you in sport, physical activity and beyond using #GreatCoaching. Recognise your own coach who lives and breathes great coaching by presenting them with a #GreatCoaching certificate (available here from the start of Coaching week). Celebrate Great Coaching by sharing your own coaching stories using the #GreatCoaching hashtag via your own social media channels. Celebrate Great Coaching by sharing great coaching content. We'll be providing you with a toolkit to get you started but we want you to generate your own materials too. If you haven't yet told us you want to be involved and would like to find out more about sharing content, please contact our Communication Team. A Level 1 Coach training course will be held in Keighley, starting on Saturday the 1st of September 2018. Haxby, York - 6 places available. Barnsley YMCA - 5 places available. Aire Valley - booking now. The YAA is registering to run a County Coach course for coaches at level 2 who wish to progress to the next level. The County Coaching course is for coaches currently working with, or aspiring to work with, talented archers in a performance environment. Have a desire to coach individuals to higher levels of performance in a talent/performance context. County Coach is the L3 equivalent grade that moves from club-based coaching to performance-based coaching and applicants will be interviewed to ensure they have sufficient background in the sport to enable them to make this move. Junior sessions are open to all age groups of Arrowhawks attendees - new members welcome. Open sessions may be any junior members plus open to any other archers senior or junior looking for coaching/development support. Open places must be booked with Kath. Danny Cameron from Thirsk Bowmen was elected as the new Regional Coaching Organiser at the NCAS AGM last weekend. The last four RCOs have all been from the YAA. Norman Foster succeeded Bob Parkinson. Kath Fitzpatrick took over from Norman and stayed in post for 12 years, succeeded briefly by Carol Byde who resigned mid term with Kath standing in again. Danny is a County Coach and the first RCO for many years who has not been a Senior coach. 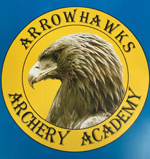 Winter training will begin again in October as part of an academy provision which will be starting in York through the new Arrowhawks Archery Academy. This will bring the national talent development pathway into a regional and county locality through three venues in York. As many know I have worked with Archery GB on the national academy for just over six years. In the past couple of years the number of juniors coming into talent development from the north has drastically reduced, though there is an increase from the midlands and south. It was evident that something needed to be done in the north since the regional AGB Academy closed a year ago and everything moved to Lilleshall, significantly increasing costs for northern juniors. With support from the National Academy team, I have stepped out of the Academy this year while remaining involved with the talent coach team so that I can devote some time and resource to developing northern talent, both recurve and compound. To do this I have secured use of facilities in York and registered a club, Arrowhawks (one venue is at the York Bird of Prey Centre), to provide a basis for the academy. Although it won't be a club in the usual sense, with no beginners or regular weekday shooting other than training and coaching sessions, it will aim to provide for recurve and compound juniors and also provide facilities for YAA senior squad sessions as well as open coaching days and coach development. This is being developed with the support of Archery GB and archers in the north will be referred there for additional support, as well as existing and past national academy members. It is not an ATC as such so that we have greater flexibility, but will be similar in operation. The existing YAA junior squad will be part of this development with coaching teams for under 12 led by Lesley Wallace, 13-20 academy led by myself and senior squad led by Ian Foster. There will also be support for university students in specific sessions. There will be costs for sessions and block booking for the academy will be available as we do have venue costs and travel costs to cover for the coaches. However, the aim is to keep this affordable for all, not to make profit. The strength and conditioning programmes from the national academy, developed by the English Institute for Sport, will also be brought in supported by Bev Detoeuf and Lynette Williams, both qualified in physical training as well as being archery coaches. It is with great sadness that I was informed that Tom Musgrove passed away on Monday September 4th 2017. Tom was an amazing person and coach and I count myself privileged to have known him as a coach, friend and mentor for so many years. Tom and Stan Snow were synonymous with Yorkshire archery and coaching when Mick and I came into archery in the early 80s. Tom was a Senior Coach before I was born! He went on to be a National Coach, working with the country's top juniors in the national squad, and was also responsible for the original Leader course. He was an avid learner as well as an educator, being one of the first to gain the new NCF-developed Degree in Sports Coaching, following this up with a Diploma in Sports Psychology - just to see and understand the relatively new field. He had an enquiring mind and would love nothing more than to debate new ideas and research he had read - and playing devil's advocate just to see if you would stick to your opinions! I don't know what Tom's epitaph would be, but whenever I think of him I can always hear him say "of course". A great man and coach and I for one will miss just knowing that he's there if needed - as he always was. At the January 2017 Committee Meeting, the YAA Committee reviewed the YAA Coach Qualification Grant Policy. Based on evidence of claims received during 2016 it was agreed that the September 2015 Policy would be amended to issue Coach Qualification Grants during 2017 as they are received, rather than waiting until 31st of January of the following year. In line with the paragraph from the original May 2014 Policy, but updated in terms of dates, this revised policy will take effect from 1 January 2017 for coaches qualifying at Level 1, Level 2, County Coach and Senior Coach. Applications for grants from coaches qualifying at these levels in the 12 months prior to this date will be accepted. No applications for grants will be accepted for any coach qualification achieved before 1 January 2016. In future, retrospective applications will be accepted for Coach Qualification Grants from coaches qualifying in the current and previous calendar years only. The date of course completion will be taken as the date of the issue of the Coach Qualification Certificate. This policy will be reviewed throughout 2017, with a view to not exceeding the maximum budget set by the Committee at the January 2017 Committee Meeting. If the amount claimed during 2017 is greater than the budget set, this grant scheme may be withdrawn with immediate effect. As with all YAA grants, all applications will be considered on merit by the YAA Committee, giving due consideration to the state of the association's circumstances and finances at the time of considering the application. The grant is only available to coaches affiliated to the YAA, either through their club or directly, and who operate as coaches in the YAA area. The application for a Coach Qualification Grant must be made on the application form below and must be accompanied by a COPY of the Coach Qualification Certificate. The completed application should be sent to the YAA Treasurer at the address given in the form. Applications via e-mail are acceptable, providing a copy of the certificate is attached.